It's ok, Varly. You'll save it when it matters - right? Last night's 6-0 drubbing by the Los Angeles Kings seems to have a lot of Avalanche fans worried. Four games into the preseason, and we’re already getting apologetic tweets to fans from Avalanche players. This can’t be good, right? For those of you keeping score at home, over the last ten preseasons, Colorado has had a winning record six times, a losing record three times, and a .500 record once. In the years they had a winning record, the Avs averaged 95.3 points. There are two outliers (the team's best year, 2000-01, and one of the team's worst, 2008-09) but even if we take them out, the average only rises to about 96 points. From these winning preseason teams, there came one Cup Champion (01), three Round Two losers (04, 06, 08), and two No Playoffs (07, 09). 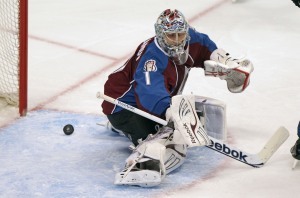 In the years they had a losing or .500 record, the Avalanche averaged just 91.75 points. From this group, there was one Conference Finals Attendee (02), two Round One losers (03, 10), and one No Playoffs (11). Not much. The Avs are normally a pretty decent preseason club, with an overall record of 35-24-7. Is the 3.55 point gap between the winning and losing teams that significant? Not at all. The Avs have remained remarkably consistent through the years. If we take out the stellar Stanley Cup season, the winning preseason record teams are left with an average of just 90.8 regular season points. The lesson from all of this? These games don't count, and for guys who have to put 100% effort into 82+ games over the next 7+ months, it has to be pretty hard to get full adrenaline pumping over a meaningless preseason game. I understand that people are worried that Landeskog hasn't scored and that Duchene isn't dominating, but things will come around. If Avalanche history has taught us anything, we're looking at, the very least, 95 points this season. If not, be ready for a lottery pick, Capitals fans!